Medical Gas Equipment Market size is set to exceed USD 7.2 billion by 2024; according to a new research report by Global Market Insights. Increasing prevalence of infectious diseases coupled with growing public awareness levels for early diagnosis and prevention will drive demand for point of care diagnostics. Technological advancements in DNA sequencing and analysis will enable faster and accurate detection of causative agents, thereby propelling market growth. Growing influence of home healthcare facilities that provide improved convenience for various respiratory diseases will drive medical gas equipment market. Vacuum systems accounted for largest revenue of USD 1,353.4 million in 2017 Advanced designs enable efficient working of medical gas delivery system. Novel design with minimal complications coupled maximum efficiency and easy maintenance will spur segmental growth in the future. With various technological advances such as reduced noise level and easy cleaning system, vacuum systems segment will witness tremendous growth. Hospitals segment is expected to expand at CAGR of 7.5% during the projected timeframe. Increasing number of patient visit and growing number of respiratory procedures in hospitals should increase demand for medical gas equipment over the forecast period. Advanced treatment procedures offered in hospitals along with growing burden of asthma will propel hospital segment. Favorable reimbursement policies coupled with increasing patient preference and affordability will favor segmental growth over forecast timeframe. Germany medical gas equipment market will grow at 6.7%, owing to high pervasiveness of pulmonary artery disease. According to Institute for Health Metrics and Evaluation, COPD ranks 5th in terms of disease causing most deaths. Adoption of unhealth habits such as smoking are major cause of high prevalence rate. High prevalence rate and increasing healthcare expenditure will further lead to business growth in the future. 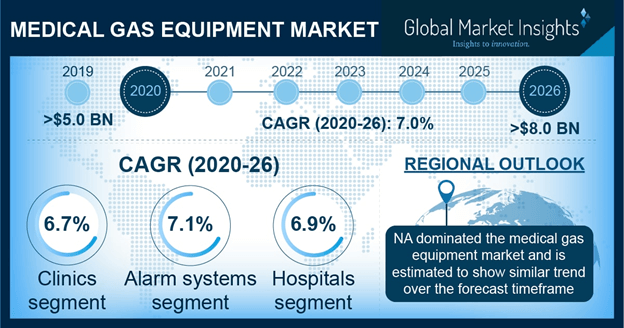 Japan medical gas equipment market contributed to revenue size of USD 291.2 million in 2017 owing to increasing geriatric population coupled with rising burden of respiratory disease. According to Japan's Ministry of Health Labor and Welfare (MHLW), currently, about 20% of the Japanese population aged above 60 years. Favorable insurance policies in Japan will increase adoption rate of medical gas equipment, thereby propelling industry growth. Some of the prominent players involved in Medical gas equipment market are Air Liquide, Allied Healthcare Products Inc., Amico Corp., BeaconMedæs, Gentec Corp., Linde Gas, Matheson Tri-Gas Inc., Ohio Medical, Powerex and Praxair Inc. These firms adopt strategic initiatives including mergers and acquisitions, new product launch and geographical expansion.